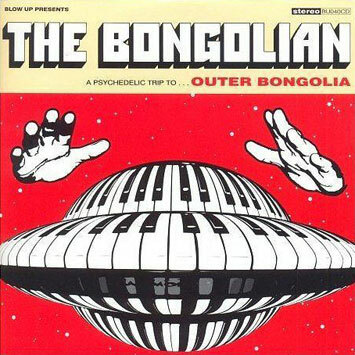 Nasser Bouzida a.k.a 'The Bongolian' releases his third album 'Outer Bongolia' on Monday 5th November 2007. This is Nasser in his element as he embarks on a psychedelic musical trip to the outer regions of the Funk galaxy, taking in spaced-out heavy Bongo rhythms and Latin Soul along the way – all 100% Original Dancefloor Rhythms. (Instruments featured include the Hammond, Bongos, Synthesisers, Vibes.) Written, arranged, performed and produced entirely by Nasser at his Ramshackle Studios on analogue 8 track, the album was mixed by Nick Terry (Klaxons, SMD) at The Premises in Hackney, London. Please note, this album contains NO SAMPLES, just a groove that sounds good! In 2001, whilst still writing and performing with Big Boss Man, multi-instrumentalist Nasser Bouzida disappeared into his studio to create a brand new sound, and his new alter ego The Bongolian was born. And for a young man whose principal interests are drums and percussion being The Bongolian makes a whole lotta sense. Drawing on all his past influences, Nasser produced an inspired recording blending elements of Funk, Soul and Jazz with grinding percussion and heavy Bongo rhythms. This new sound was epitomised by the funky rhythmic stomp of his debut single 'Bongohead'. This was swiftly followed by his eponymous debut LP 'The Bongolian' which received much critical acclaim, and in 2006 he released his second album 'Blueprint'. Having played all the instruments for the studio recording himself, The Bongolian has had to assemble various line-ups in order for The Bongolian sound to hit the road. The Bongolian's debut gig was a headline slot at the prestigious Rennes Jazz Festival in France, and has been followed by more gigs in Europe and a series of UK gigs including a sell out hometown show at London's Metro Club. In 2005, The Bongolian also toured and recorded with Holly Golightly (as support and also playing in her band) in the UK, the USA and Germany. "Don’t waste time reading this tracklisting this album was made for dancing to." 4/5 – OK!